Gajar ka raita (Carrot with yogurt) is tasty, crunchy and colorful dish. It is very refreshing, cool and healthy and looks very tempting. 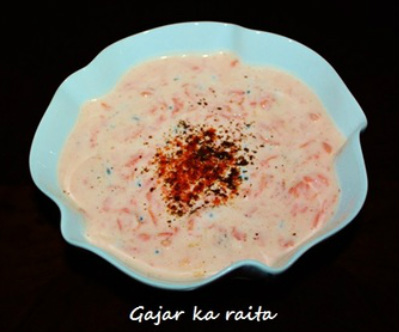 Gajar ka raita is a very simple dish which does not require any cooking. It is prepared with mixing shredded carrots with yogurt and flavored with cumin seed and mustard seed Tadka. The sweetness of carrot is very well balanced with sourness from the yogurt. It is a very easy to make and an interesting way to serve carrots. This raita can be served with any dish and any Indian bread. 1. In a bowl whisk the yogurt and add grated carrots and mix them well. 5. Keep in refrigerator and serve it chill.